TheRustedChain - The Blog: A party, a recipe, and a jewelry giveaway! A party, a recipe, and a jewelry giveaway! It's the middle of summer. What a great time to have a party! I'm joining a group of amazing bloggers for a Mid-Summer party. You need to be sure and click around to see what other hosts are doing. Lots of giveaways and fun going on! 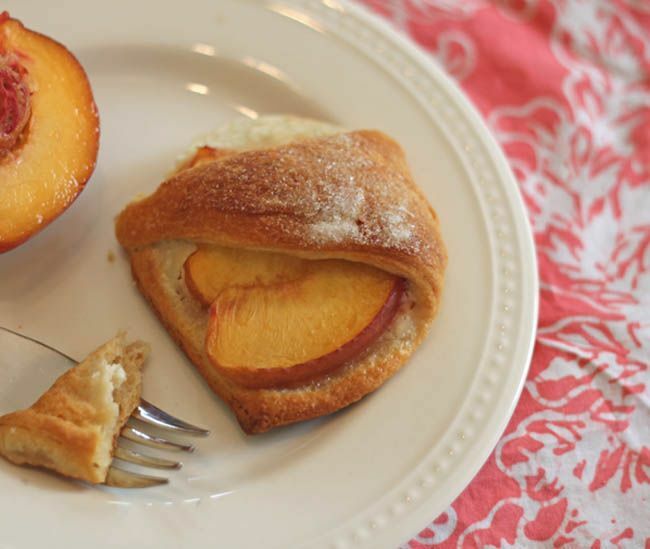 Do you remember back in the Fall when I showed you the recipe for Apple Cream Cheese Danishes? Well I switched them up this week to reflect the best of summer. Peaches! So easy and delicious. Perfect as a dessert, snack, or brunch item. You need - 8 oz. block of cream cheese (I use 1/3 less fat), 1/3 cup sugar, 1 egg, 1 tsp vanilla, 1 pack of refrigerated crescent rolls, peaches. Slice the peaches thinly. I don't even take the skins off. Mix your cream cheese, sugar, egg, and vanilla until smooth. Open the crescent rolls and seperate into triangles. I like to curl up the edges a bit to make a little cup or bowl shape. Spoon in a helping of the cream cheese mixture. It'll be runny so the edges on your crescent roll will help. Top with several peach slices. Fold over one corner of the crescent to meet the other. There really is no rhyme or reason. Just put it together. Super easy. It's gonna taste great, no matter how it looks. Sprinkle the top of each danish with sugar (maybe even cinnamon!) and bake at 400 until the tops are golden brown. Now the fun part that you're really here for - the giveaway! You're playing for a $25 gift certificate to TheRustedChain.com. I like to make things easy. 1. Just leave a comment telling what you'd spend your $25 on if you win! 2. If you want to blog it, tweet it, or facebook it you can earn additional entries. Just leave a seperate comment for each of these you do. I would get a necklace with my daughter's name on it! I would love to get a necklace, maybe with my 3 kids' names on it, or I love the capture life one....there are so many to choose from!! Oh my goodness I am drooling!! Those look so yummy! Beki, I just love your jewelry. And have I mentioned how fun it is to see my I Love You More necklace in the shop? So exciting. ;) I really love the Fly necklace, and the Two Tabs. I love the soar necklace! I love many of your pieces! But the "In Christ Alone" has been my fav since I first found your shop! I still so love the soar necklace. Although I'm terribly tempted to get the "I shoot people" necklace for my photographer friend! I'd get the "capture life" necklace for my sister-in-law, who's really getting into photography! Ohh, I love the Fly necklace! It's a toss up between "soar" and "blessed"! Oh I just love the "I Love You More" necklace. the bird! i love the bird!!!! I'd use mine toward the "I love you more" necklace! I would love a SOAR necklace! So pretty! Definately the Amazing Grace necklace. Wow, it's so hard to pick a fav! I really like the belive one. I think I'd like the Soar necklace. I have the Blessed necklace and really love it. Or maybe I'd order charms with my kiddos' names... I LOVE your jewelry! Any plans for an owl? I heart the "I shoot people" one...or one with my girls initials..love your work! I'd get the monogram necklace or the Angels sang necklace to include my 4 kids names!!! Please pick me, pick me!!! For sure I would get the Capture Life photography necklace! It almost completely matches the tag line of my business. LOVE it! I'm a total Gleek so that one would be cool or the "hope in love" one. Beautiful pieces! I would purchase either the "Born in My Heart" necklace or the "Gleek" one. LOVE both almost as much as my "I shoot people" one. I would so get the "Love gives me hope"! I have always loved that one. By the way, my girls LOVE their necklaces! Thanks! i would love a necklace with a monogram! so beautiful! Stop by my blog this week for 8 awesome etsy and other handmade shop giveaways!!! Still trying for that capture life. Its my fav! Too much I want- probably either those pearl drop earrings or a necklace with my kids names. I would get the J'adore necklace, because my husband and I just got back from a trip to France! It would be perfect! I would get a necklace with my kids names on it. So beautiful! okay. I just might have to have that i shoot people necklace. I love it. I would get the Ella earrings and the Capture Life necklace!! Love them all, so hard to decide!! I'd get the cherish necklace! I would choose the "fly" necklace that says "soar." Love it! love the create, dream , inspire necklace! The pretty bird with soar has been on my wish list for awhile now. Maybe I'll be lucky and win it! Your creations are just so lovely! I would love the 2 tabs necklace with my 2 rugrats' names on them...don't have anything at all with my baby's name yet, so that would be sooooo awesome! Thanks for making such pretty things! I'd put it toward the When You Were Born Angels Sang necklace :) Thanks for the opportunity! There's so many great things to choose from! I would have to choose between the "In Christ Alone" necklace and "Dream. Teach. Inspire" necklace. I would love to own the Cherished necklace! I think I would go for the bird Fly Necklace. I just keep coming back to that one. Maybe I will be able to get it with some birthday money. :) So cute! I posted in my facebook. The Worship Always one caught my eye this morning. I would like one of your necklaces, customized with the word "surrender" hammered into it. I LOVE the Create.Dream.Inspire necklace. That is just my style! Soar necklace! Without a doubt! I would get the Believe Necklace, Thanks for the giveaway!! I'm a fan on FB and I saw your giveaway post. I love, love, love that EST. necklace! I've had my eye on that for a long time. I would buy the soar pendant. Adorable! I would choose the "Daddy is our Hero" keychain for my husband! I've just spent the last 15 minutes looking at all your beautiful creations. I would choose the "create, dream, inspire" necklace, but honestly they are all gorgeous! I love the j'dore necklace, the plant seeds necklace, and the cherish necklace. They are all gorgeous! I added a link to my blog, too! What a precious way this would be to remember my 3 girls! love it! I have not seen your site before, but I like your stuff a lot!!! I love the hand-stamped stuff! I would definitely use the gc on the Est. necklace. Very cool!!! Thanks! It's hard to decide between the All I Need or the Soar! I love the creativity in all the necklaces! I would pick the Capture Life necklace, even thought all your things are so beautiful I struggle so much deciding! Oh, I NEED the Capture Life necklace! It's what I do! I love them all. How can I decide?? I love the Cherish necklace. Love it. I would get happy day and anna earrings. I would love to have the j'adore necklace! ty for the chance! i LOVE your jewelry:)i would definitely pick the "how great is our God" necklace...He is great! have a wonderful weekend! God bless! Definitely the Blessed necklace! I love it! i love the loved and adored necklace. I love the "How Great is our God" one! I adore the Create.Dream.Inspire necklace, so I would probably get that one! It's so hard to choose!!! I've narrowed it down to three, In Christ Alone, How Great is Our God, and Believe! I can't tell you how much I am loving The Rusty Chain! I love the choose happiness! I would choose the Live It,Dream It,Do It Necklace-lovely grad present for my daughter. The Gleek (Glee) necklace is SO SO cute! 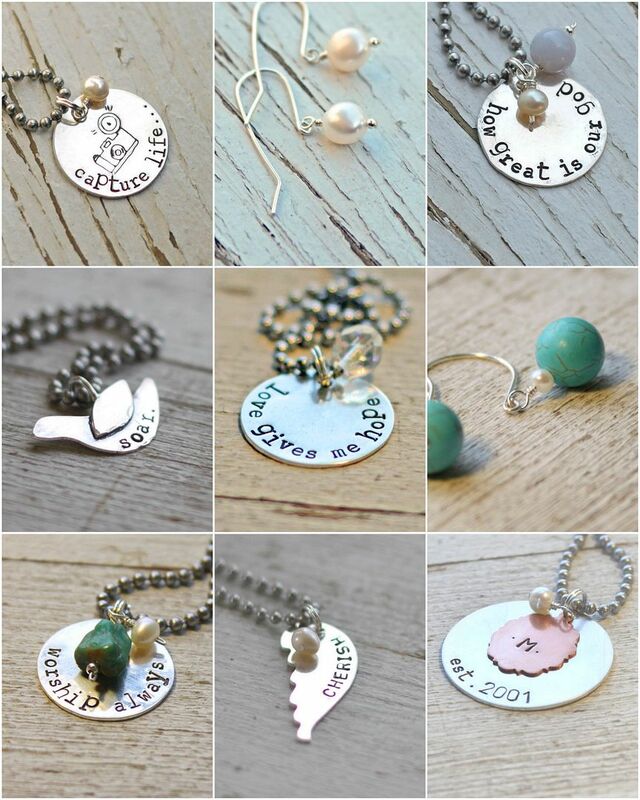 So many choices, I like the love gives hope necklace, but they are all gorgeous! Thanks for the chance to win! The Love Gives Me Hope necklace is adorable! I cannot decide...one of the necklaces, but they all rock. Thanks for the great giveaway! i would buy the worship always necklace. i love the turquoise with the pearl. Wow! Such wonderful pieces! I like the Amazing Graze and Fly necklaces; hard to choose. Thanks for the op. I'd get a necklace for my SIL, she just had a baby. Drop pearl earrings are beautiful! I am loving the Choose Happiness necklace-it's great and so cute too! I would love to get the Family Monogram necklace. I'd get the pearl earrings. Love them. I think I would get the two tabs necklace. Love it! I would love a custom piece - maybe something about my dog. I shoot people is really funny too. I love the life captured!!! This is an easy choice, I desperately want the amazing grace necklace. I would never take it off, except to shower. I've learned a lot about accepting and trusting God's grace over the past few years, and I don't ever want to forget it. Thank you for your beautiful art, and for occasionally giving some of it away. God bless you. I love the Fly necklace! It's definitely hard to pick, but at this moment I'm thinking I might go with some earrings! I would love a necklace with my kids names on it. Funky Mama, Three Names, Full of Love! Or a family necklace. Not sure which I would pick. They are all fabulous. OR possibly the Gleek necklace for my college bound niece. Decisions, decisions. The soar necklace for sure - just love it! i would buy the our family necklace ~ since we are now a family after welcoming our little girl 9 weeks ago! god is good - that's the one that i would pick. even though i have had and still have god is good all the time. I love the soar bird, but would also like a necklace with my girls name. I'd get the Soar necklace! I love the "Capture life" necklace. Thanks. I would get a monogram necklace. Just had my first little dude last month. Would love something with his name on it! I would definitely choose the "I love you more" necklace, me and my boys say this to each other every night before bed, precious. I would probably get a the capture life, of God is good. I also like the soar, or the blessed. there are so may great choices. I'd choose the You'll Be In My Heart necklace if I won! Wow I love everything! I'd probably get a necklace with the name "Haylee" on it! I would get the inner circle necklace! Choose Happines has always been my fav! I've browsed your site several times. If I had $25 I would probably buy that and a few other things...like "soar" and I'm definitely a "gLeek" so I may have to have it too!...We're getting on up there. Hope I win so I don't have to spend that much for all of them!! I also posted it on my blog! If I win the $25 gift card, I would chip in a bit and get myself the Est. Necklace. It is antique looking with a touch of modernity. I love the soar necklace - so pretty! If I won, I would pick the "Capture Life"...it's my favorite. I'm a photographer and this is PERFECT! :) Love it! The Capture Life neclacke, for sure! Usually I pick things for other people....but that has MY name all over it!!! I would get the "Capture Life" necklace! I would get the "Est. Necklace" I love it! The Est. necklace is my favorite! I REALLY want one of the photography necklaces!! I have been trying to win them on all the giveaways lately!! I am a fan on Facebook!!! LOVE your stuff!!! Tweeted your blog today! Love reading about your life, love your jewelry...I'd get an everyday necklace, something simple that goes with EVERYTHING! I'd get one with my daughter's name on it! Oh I hope I am not too late to enter this!!! I would get a necklace with our family initial and establishment date. LOVE LOVE LOVE it!!! I am totally blessed by your Christian jewelry!! So hard to find. I love the 'in Christ alone' necklace and the 'worship always' necklace. And I really like the 'I have all I need' necklace too. I'd definitely pick one of those! Thanks for the chance to win one. I love the "God is good" necklace! The bird with "mama." on it for sure! I LOVE the Capture Life necklace...beautiful stuff! I love the Fly necklace! Heck, I love all of it! i'd just barely be getting started with that....but it's a good place to start!! I love your jewelry!! I would get a necklace for my daughter. I love your jewelry! I would want the round "how great is our God" with a pearl on it! Thanks for doing these wonderful giveaways!! I would get the love squared necklace. I love it!